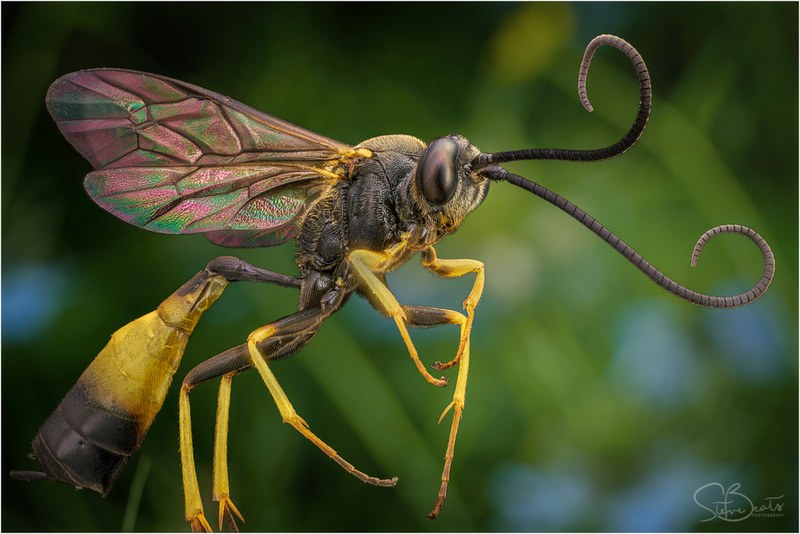 www.photomacrography.net :: View topic - Female parasitic wasp - possibly Dusona sp. Female parasitic wasp - possibly Dusona sp. Posted: Thu Jun 07, 2018 9:09 am Post subject: Female parasitic wasp - possibly Dusona sp. Edit: changed title to reflect ID correction from AlxndrBrg (thanks again for that). Stack of 210 images at 2.1x (Linoscan 90mm film scanner lens). The FoV is about 15mm wide. Background is a quick bit of fakery - just a blurred shot of some undergrowth dropped in with Affinity Photo. Bored of black! Very nice, the light on the wings are superb. Should be the subfamily Campopleginae, something like the genus Dusona. Beautiful, and the background looks very natural. Gosh - I honestly thought, for once, I'd actually nailed the ID myself (using online resources). I'll look it up tomorrow and edit as appropriate. Appreciate the info - even if it has rather burst my bubble! Thanks all for the other comments too. I got try some linos lens, this is beautiful. I've changed the title to reflect your earlier comment. Thanks.